The video surveillance market, as a whole, is growing at a significant rate and is expected to reach a substantial level by 2023. Moreover, the video management systems are gaining popularity, and the sector is expected to grow at a robust rate in the future. The report presents a detailed market analysis including an in-depth analysis of the market drivers, opportunities, challenges, and growth trend mapped across equipment, software, services, application, and geographies. The market is segmented on the basis of ecosystem (cameras, monitors, storage and software), application areas and geographical regions. The rising security concerns, along with the need for highly efficient, time-saving surveillance systems at affordable costs, is one of the pressing matters to be looked upon in the current scenario. The effort to deliver such solutions, along with the growing application across various verticals, is acting as one of the major drivers for the video surveillance industry. The increasing demand for Video Content Analytics (VCA) and Video Surveillance as a Service (VSaaS), incorporation of artificial intelligence in video surveillance systems, increasing demand of intelligent transportation systems, and integration of surveillance with technologies such as drones and body-worn cameras have been identified as the key opportunities that could escalate the market growth in the coming years. However, lack of standardization, high initial costs, and threat to data integrity continue to remain the pain points of the market. Moreover, the reduction in the cost of cloud storage solution has surfaced as a key opportunity for service players in the video surveillance market. The video surveillance ecosystem chapter is the result of a comprehensive and rigorous research. The chapter is divided into three major ecosystems which are the camera, monitors, storage and software. Cameras are further segmented by technology, connectivity, resolution, and product type. Storage section is discussed under two subheadings of storage media and technology. The information supplied in the chapter includes key market players, market size, key restraints, and growth opportunities. The software market deals with video analytics, Video Management Software (VMS) and Video Surveillance as a Service (VSaaS). Each segment is presented with the key players, restraints, and opportunities in addition to the applications of these software in the video surveillance market. The next segment discusses the evolving market of Video Surveillance as a Service. This segment also discusses the market of VSaaS across different applications, geographies and types. Since the last decade, video surveillance systems have penetrated a plethora of application areas including parks, stadiums, hospitals, retail outlets, bank, and institutions among others. The report provides an exhaustive application analysis including the market statistics for different verticals such as commercial, infrastructure and others and enumerates various use cases with a futuristic roadmap for each industry vertical. 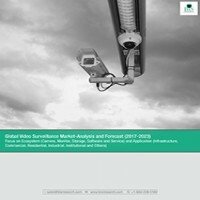 An extensive research and study on the leading as well as developing regions in the video surveillance market such as APAC, North America, Middle East, and Latin America, the report provides the market statistics, drivers, challenges, and opportunities across these regions. The report also formulates the entire value chain of the market, along with industry trends of video surveillance equipment, software, and services with emphasis on market timelines & technology roadmaps, and market dynamics. Some of the key players identified in the report are Avigilon Corporation (Canada), Axis Communication (U.S.), Panasonic Corporation (Japan), Hanwha Techwin Co. Ltd (Korea), Bosch Security systems (Germany) and Hangzhou Hikvision Digital Technology Co., Ltd. (China), among others. • What will be the global video surveillance market value by 2023 along with the estimated CAGR? • What are the driving factors for the global video surveillance market through 2017 to 2023? • Which factors are impeding the growth of the global video surveillance market? • How will IP cameras surpass the demands of analog video surveillance systems in the next two years? • Which storage technology will prove to be the most cost-efficient for video surveillance systems? • What is the importance of software in video surveillance systems? • Which application will dominate the global video surveillance application market by 2023? • Which region will lead the global video surveillance market by 2023? 7.6 Dahua Technology Co., Ltd.
7.8 Hangzhou Hikvision Digital Technology Co., Ltd.
7.9 Hanwha Techwin CO., LTD. The process of the evolution of video surveillance cameras and technologies has considerably changed the overall surveillance industry in terms of money saving, increased safety, and convenience of the users. The video surveillance market, as a whole, is growing at a significant rate and is expected to reach a substantial level by 2023. Moreover, the video management systems are gaining popularity, and the sector is expected to grow at a robust rate in the future. The video surveillance market is witnessing a pattern of transition due to the increasing market penetration of IP cameras. The IP camera market is expected to grow at a significant rate during the forecast period. This can be attributed to the fact that it allows the users to convert their local broadband connection into a home surveillance system. These cameras provide several benefits when compared with the traditional analog cameras, such as low cost, and high durability. There is no doubt that the market has many driving forces which will contribute in the mushrooming demand of video surveillance systems, but there are certain restrains that could be plaguing the video surveillance market in the coming years. For example, the changing trend to IP based video surveillance systems will present the need of high capacity storage solutions, because of the ability of continuous monitoring and high quality output. Moreover, as the world becomes more and more networked, the integrity of the recorded data could be compromised. Hence, lack of standardization and data surveillance laws continue to be the pain points for the market. Also, the existing security personnel are not familiar with the concepts of networking and related aspects. Therefore, the market is experiencing a lack of skilled professionals that could manage both the operation and software problems in a surveillance system. The video surveillance market has been tracked along the lines of its ecosystem (cameras, storage, monitors and software), application areas, and geography. Revenue generated from various application areas, namely residential, commercial, infrastructure, industrial and institutional applications have been analyzed. The report also covers the video surveillance market on a global scale, and consequently provides revenue data of the key regions. A separate segment has been made for the key global regions: North America, Europe, Asia Pacific (APAC), and Rest of the World (ROW). Cameras are the most important part of any surveillance system. The overall cost of a set-up depends significantly on the area covered for surveillance, and equipment like cameras, storage media, monitors, digital video recorders, and others. As a result of the rising number of video cameras, the need for video analytics, and video management systems has increased which has contributed to the growth of the video surveillance industry. The segment of video surveillance software and services market provides a detailed market study of the major types of video surveillance software-video analytics and VMS and Video Surveillance as a Service (VSaaS). The video analytics market is still at the nascent stage and hence currently has a very application specific approach in the market. The current major application is surveillance, but entertainment and visual communication applications have started witnessing growth lately. The Video management software (VMS) serves as an important tool to record and view live video footage from multiple surveillance cameras for both IP and analog cameras with an encoder. It also helps in monitoring alarms, controlling cameras and retrieving recordings from an archive. The application areas for video surveillance systems have increased steadily over the past five years. This increase can be primarily attributed to the increasing penetration of connectivity solutions and the trend to deploy integrated solutions across end user applications. Also, the rising need for safety and security of infrastructure and people has further facilitated the proliferation of surveillance systems among the consumers. With a meticulous approach, the market study has identified APAC as the leading region in the global video surveillance ecosystem market accounting for almost 43% of the net revenue generated by the video surveillance equipment, software, and services, and is expected to continue with its dominance during the forecast period as well. Europe is also anticipated to be a promising market with explosive demands expected from the U.K., Germany and other European nations.